President Trump’s nominee for Attorney General will be on Capitol Hill Tuesday and Wednesday for his confirmation hearing and according to his prepared remarks obtained by the Associated Press, Barr will tell Senators it’s “vitally important” that Mueller finish his Russia witch hunt. Also, according to Barr’s prepared remarks, if confirmed, Barr will focus on immigration enforcement (Sessions 2.0). Barr said Trump “sought no assurances, promises, or commitments from me of any kind, either express or implied, and I have not given him any”, other than a promise to run the department with integrity, reported AP. President Donald Trump’s nominee for attorney general will tell senators at his confirmation hearing “it is vitally important” that special counsel Robert Mueller be allowed to complete his Russia investigation. That’s according to a transcript of William Barr’s prepared remarks obtained Monday by The Associated Press. Last week, Senate Judiciary Chairman Lindsey Graham (R-SC) met with Bill Barr and told reporters Barr and Mueller have been ‘best friends for 20 years‘ and that Barr has a ‘high opinion’ of Mueller. “I didn’t know that they worked together, that they were that close personally and that they worked together for years,” Graham said. Lindsey Graham explained that the two are so close that their wives attend the same Bible study and Mueller attended two of Barr’s daughters’ weddings, reported the Daily Mail. Barr also told Lindsey Graham that he would like to make Mueller’s report on President Trump public because he believes it’s better to be transparent. How can President Trump drain the swamp if Mueller’s best friend, Bill Barr becomes the next Attorney General? Although Democrats have been screeching for Bill Barr to recuse himself from the Mueller investigation, Barr has not indicated he will recuse himself…yet. 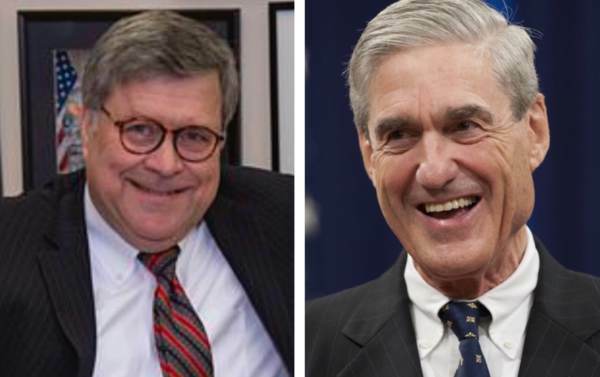 The post Bill Barr to Tell Senators During Confirmation Hearing, “It’s Vitally Important” That Mueller Complete Russia Probe appeared first on The Gateway Pundit.